A team from the University of Adelaide is looking to reduce the alarming number of quad bike deaths and injuries occurring in farming families each year. Their new report urges Australian farmers to replace their quad bikes with safer alternatives, to prevent children under the age of 16 from riding them, and to wear helmets. From 2000–2014 there were 161 fatal quad bike accidents in Australia, in which 16 per cent of those killed were children under the age of 16. The study, commissioned by SafeWork SA, used national and State data on quad bike accidents and involved interviews with injured riders and farmers. It found that 44 per cent of the interviewed riders allowed children aged under 16 years to ride quad bikes. 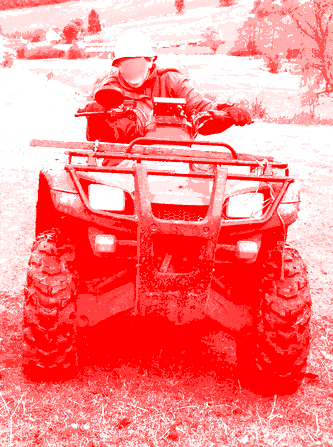 Additionally, the majority of quad bike fatalities were found to be on agricultural properties (59 per cent), more than half (56per cent) of all quad fatalities involved the quad rolling over, causing crushing injuries. Head injuries were found in 38 per cent of fatal cases, with helmets usually not worn by riders or passengers. “Many quad bike riders have the belief that these vehicles are an all-terrain vehicle and therefore safe and stable to ride, but this leads to a false sense of security. In fact, quad bikes have become the leading cause of unintentional death on Australian farms,” says the report's lead author, Dr Lisa Wundersitz. “This study is the first of its kind to examine in-depth the circumstances of both fatal and non-fatal quad bike incidents in South Australia, and to evaluate the risks involved in such incidents. We hope our recommendations will help to save lives and prevent serious injury among agricultural workers and their children,” she says. The study found that one of the most common yet riskiest tasks undertaken by quad bike riders in farming is mustering or chasing livestock. “Typically, quad bikes overturn when used on steep inclines, when they are carrying heavy loads, from turning too sharply, or simply because the vehicle has struck a hidden rock in the ground,” Dr Wundersitz said.